I recently heard the term ‘dirt farmer’ used for the first time while listening to a Podcast . It was used to describe a certain group of farmers in a derogatory fashion as to devalue their deliberate use of traditional farming methods as ‘inferior’ to what was described as ‘modern’ farmers. Devaluation of natural methods as somehow ‘dirty’ and the positioning of the big-ag approach of inhumane clean-room operations as ‘scientific’ and ‘modern’ are all part of a public relations battle for the mind-share of the un-educated consumer. There is plenty of evidence that small-scale localised food production is far superior to large scale industrial food production when taking into account not just purely economic factors such as cost of labor. Factoring in things such supply chain wastage, transport cost, overproduction and social impact (unemployment, community support, …) and general health benefits shifts the scale from the pure economics of monetary input vs. output cost. This entry was posted in Food Production on April 10, 2013 by leogaggl. This is highly recommended work of the Design Trust for Public Space on the implementation of the Five Boroughs Farm project in New York City and the subsequent studies of the impact that urban agriculture can have on low-income areas of a city. Design Trust has developed a metrics framework that measures the associated activities of urban agriculture with the known benefits derived from such activities. Design Trust is currently developing a open tool that can help urban farmers measure these benefits. 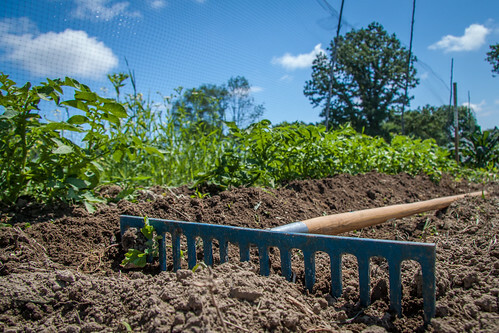 The sample of the tool available from the Five Borough Farms website allows the recording of the economic benefits such as the amount of food produced in weight or the number of people trained in a specific skillset on the urban farm. There are plans to release the Data Collection Tool to the public in the near future with the metric framework. This should help urban farmers from the around the world to collect important data with ease and have the right tools to persuade public officials on the benefits that urban agriculture can bring to a city. It will also allow to be combined with other data on public spaces such as the 596 Acres project which shows sites of potential to community projects. They have taken several different sources of information about vacant publicly owned land and shared them. This entry was posted in Food Production on April 9, 2013 by leogaggl.